When Death first meets Liesel Meminger she is standing beside a railway track with her mother, and her mother is holding the dead body of Liesel’s little brother. The little family is traveling to a town where the children are to be left with a foster family. Now Liesel will be the only one who is left at the house on Himmel Street. Now she will be left alone with Hans and Rosa Hubberman. But before she gets to Himmel Street Liesel and her mother have to bury Liesel’s little brother and though he cannot say why for sure, Death chooses to be there. That is how it is that Death is the only one to notice when Liesel steals her first book. 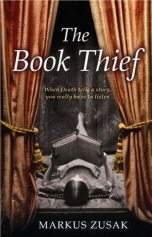 She steals “The Gravedigger’s Handbook” and Death from that time on calls the thin little nine-year-old, the Book Thief. It takes some time but Liesel begins to settle in at the house on Himmel Street. She grows to love Hans and she gets used to Rosa’s swearings and scowlings. Liesel makes friends with the children on the street and when she cannot sleep at night because of nightmares, Hans begins to teach Liesel how to read and write. Together they start to read “The Grave Diggers Handbook” and later, during a Nazi book burning, Liesel steals yet another book. For her the words give her comfort. They take her away from the hardships of life in Nazi Germany, and they give her a direction and a goal. Then someone new comes into Liesel’s life, someone unexpected and different. Hans Hubberman decides to give shelter to a runaway Jew. Max is in a very bad way when he arrives, worn out in body and spirit. Bit by bit he and Liesel become friends until Max begins to create a book for her. It is the story of his life and it is a truly precious gift. Being with Max shows Liesel that the Fuhrer’s words are just rantings and ravings, and that Jews are not the monsters and criminals that he says they are. They are ordinary people who have been caught up in an awful nightmare. In this extraordinary book readers will be plunged into a world which is disturbing, shocking, and heart warming. Though there is much suffering and loss, there is also love and friendship. There are also books and words which help keep Liesel going even when her world seems to be collapsing. Then there is Death, the narrator who rescues one of Liesel’s precious books, who tells you her story, and who, in the process, reveals a little about himself. It would seem that he is not always able to be to be completely detached from the human world. Sometimes a human story touches him and he has to follow it to its conclusion. Written both from Death’s point of view and from the point of view of Liesel’s story, this is a book which does not follow many of the established rules about book writing. The author has gone out on a limb and the result is astonishing and unforgettable.